Good relationships with friends, family and others are vital for mental wellbeing. Building strong and broad social connections in your life can increase feelings of happiness and self-esteem. Having strong relationships with family and friends can allow us to share our feelings and know that we are understood. They also provide an opportunity to share positive experiences and can give us emotional support as well as the chance to support loved ones. So how do good relationships have an effect on mental wellbeing? • Being heard is enormously powerful. A strong and reciprocal relationship with a lover, friend or family member will provide you with sympathy and well intended advice. Discussing your thoughts and feelings in close relationships will promote healthy self-development by increasing self-awareness. • It is crucial to feel accepted. When you know that others truly know you and nonetheless accept you, it is easier to accept yourself and to see your positive traits therefore nurturing mental and emotional health. • The mind and body are linked, so good relationships can improve mental and physical health. For instance, love reduces cardiovascular reactivity to stress and having interactions with loved ones may reduce blood pressure. • Oxytocin, often called the "cuddle hormones" makes you feel good. This is usually released when you are close to someone you love. It has several effects that make it good for mental health, for instance, it makes you feel safer, less anxious and more content. 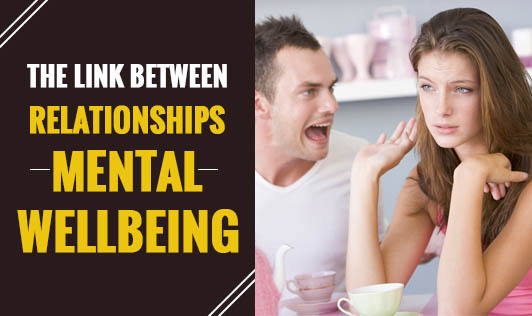 Evidence has also shown that wellbeing can be passed on through relationships, so being around people with strong mental wellbeing can also improve your own mental wellbeing.